FREE is a powerful word and a powerful force – but it doesn’t always work out the way you expect. For example this FREE iBreakfast had our lowest turnout ever - and it was essentially FREE. Apparently, people will always pay for things they are think are worthwhile to them or somehow elevate their status – and FREE never does that. This certainly applies to the world of physical goods (atoms and bagels). What about digital? In this iBreakfast we took a deep long look at the digital world where FREE is really big and almost everything online has a zero marginal – once you cover your base there are minimal additional costs. By now everyone in the business gets this. The real issue is what happens when digital FREE goes after non-digital or quasi-digital business. This is the essence of the FREE attack. We see it in Eric Frank’s Flatworld Publishing company which is going after he high-priced College text book publishers. Flatworld can ride the industry down from $10bn to $1bn because their business model is digitally energized: they get, in effect subsidized professors who developed teaching materials on the job to create textbooks inexpensively and then give them away for free on the web- but then charge for the printed versions and other learning support services. Tim Fielding at Riverphonic advises mobile clients on dealing with FREE and increasingly this will be an issue – especially as web-based services crowd out the telco’s hold on the phone deck. Additionally, almost every paid or premium web service today is likely to come under a FREE attack empowered by localization (a free feature of mobile) e.g. localized free Yelp vs. Paid Zagats. Likewise Apps are quickly tuning into free ad fodder and so on. The big question people are asking everywhere is – how do you compete with Free? The answer seems to be (1) figure out how the competitor is being funded and meet or beat that and then (2) offer a better experience (e.g. personalized, pro version or celebrity back) or rely on (3) tribe, community or status tends to trump everything. If people are on your side they’ll keep paying. Then, take this advice for what it’s worth – FREE. Note: As we write this report one of our colleagues in the Industry is facing a Free Attack – hope he takes notes. His company charges for higher priced events that give entrepreneurs access to investors. Another group wants to give it away for FREE. But if he follows the above tenets – he should do just fine. Right? I know Mike Segal of Private Equity Forums and we even promote his events. So let me stick up for him in this way: his events bring out-of-town investors and entrepreneurs to New York. That is his strong suit and has been doing that well for years, filling up room after room with investors and entrepreneurs. He deals with what I call pedigreed starts-ups: people who have serious experience in their fields, have put a good amount of money into it and can afford to pay to be in this league. Dotcoms are a small part of his world - most of his Entrepreneurs have biotech, heavy engineering, energy, packaged goods or financial services businesses. These obey very different rules from the digital world that Jason and his cohort inhabit – so before we get into some version of class war let’s understand that we are dealing with other classes of new enterprise. As the organizer of the iBreakfast I should state that we run very modestly-priced start-up events and we give our winning entrepreneurs tickets to Mike Segal’s events so they can see what his world looks like. Some of it is familiar but a lot of it is very different – his investors usually look for revenue, tangible assets, assumable debt and a host of things dotcoms start-ups are oblivious to. I can’t argue with Jason or anyone that access to investors ought to be Free. Why not? If Fred Wilson or Steve Jurvetson wants to see you – go ahead. They might even throw in a VitaminWater or buy you lunch. But unless you’re a serial entrepreneur and were recommended to them, the chances are the don’t want to see you. So events like Mike Segal’s and to some extent, the iBreakfast have emerged put you right in front of investors and get you into the general recommendation system. By organizing it into a marketplace they are entitled to charge what the market will bear. In that respect Mike is no different from a trade show producer or the Wall Street broker that takes his commission and the spread. If you think he is charging too much – don’t pay. The iBreakfast offers a low-cost pitching event that grooms, educates and gives start-ups access to investors for a nominal $125. We don’t market it like crazy but then we also don’t pack dozens and dozens of investors into one place. So take your pick. As for the groups that do it more or less free, go to them – but they are probably oversubscribed and they’ll make you wait. So, should one approach drive out the other or should all of these coexist? If Jason can attract Investors and Entrepreneurs from all over the region – or the country to an event, do it on a regular basis and give it away for Free, I say more power to him. I might have a plan or two I’d like to trot out myself. But keep in mind a few things. Free often drives out the good. Without a financial incentive there is a good chance the forum will run out of steam. Even if the forum continues, they still have to add some kind of value that makes it worthwhile for the investors to show up and for the best pitches to rise to the top. If they can do that, Free may win. Even so, many companies would still rather pay for all kinds of reasons like speed to the investor market or controlling their destiny. A big question is why would Jason do it for Free. I buy his “sticking up for the hood” motive up to a point, but the real deal is publicity for his Mahalo “people powered” pedicab of a search engine, he needs to attract contributors, fire up his base them up and make them feel important. As for the profit motive, well excuse me, Jason had no trouble charging over $1,000 for his Silicon Alley conferences when he could – thereby keeping good information and contacts away from the needy. Tech Crunch 50 is not Free. So why should these organizers behave differently? If Mike Segal can save his Entrepreneurs from traveling all over the country just to see investors and get the word out at once, then there is a value in it. Something like a road show in one place. Plus, many investors take this kind of effort seriously and see this as separating these Entrepreneurs from the pack – those which just can’t afford the effort and therefore may not be as viable. That’s why these events take place at fancy ballrooms and not at a taco stand – it makes people take these presentations seriously. Maybe the investor should be paying for the lunch but the market dictates otherwise. Trust me, the doctor who just prescribed Jason his self-righteousness pills didn’t pay for his own lunch either if he didn’t want to. The drug company was happy to pick up that tab. More importantly, if an Entrepreneur is flying in from Minneapolis, Free starts to look very iffy while a paid event says “this is happening” and his time and travel costs will not be wasted on a flake out. Likewise, investors realize their time is unlikely to be wasted by people who are not really committed to their new enterprise. Having said all that, I actually welcome Free because it forces the paid guys to do a better job or else. Plus it gives the posers a chance to discover their real selves before they do something silly like empty their trust funds. As to which approach is really better – let’s say they are different and serve different purposes that may ultimately harmonize. A free event favors just-out-of-college start-ups with those big moonshot ideas like the next Twitter, iPhone Killer App or Search Engine (know of any?) Few succeed but the ones that do, make it really big. They change the world. Paid events favor the seasoned player – the pedigreed start-up that has 10 years of experience in a field, often a mundane one where they see the real opportunity in their space, know the players, the customers and so on. There is less pizzazz and few ground-shaking ideas. The payoff is more earthly but to the investor, is also a safer bet. The true serial (and successful) entrepreneur which includes Jason, only has to pick up the phone. The sensible entrepreneur has to know which category they belong in before they choose their path but they all have their place. My prediction – a year from now, all these forums will exists in one way or another. All will do a better job and all will charge about the same – even the Free. When you make something FREE something else becomes valuable. That, according to Chris Anderson, the author of the popular new book FREE, is the secret to fighting against the phenomenon that more and more industries are having to battle: The FREE attack. The Recording Industry, Newspapers, Magazines and Hollywood have already faced this assault – so maybe we think we’ve learned a thing or two. We know ad-supported FREE (as in get eyeballs and ads will follow) and Freemium (give away the low end so that 5-10% will pay for the high end). What's worse, according to a study reported in the Silicon Alley Insider - when you get a FREE Attack - you can't have it both ways and be a mix (a/k/a Freemium) you either go completely FREE or completely subscription. Even as we absorb that message - we also need to look at something new that's coming. The new FREE ties to together the major themes of the past few years – Social Media, User Generated Media and Open Source – and then turns it on entrenched players. That could be your typical Fortune 500 Company, the Government or you. Just to be clear, the Internet introduced a kind of growth based on abundance (low-cost bandwidth) and zero-marginal cost – so once a site paid off its ever-lower set-up expenses, adding new customers cost very little. That’s standard digital FREE. The New FREE is when companies aggregate Crowd Wisdom and particularly, Social Media groups, to go after high value targets. Flat World Knowledge is using this to go after the high value college text book industry: by using professors without typical publishing advances they are able to give away the books to students – and still make money. How long before mobile apps are harnessed in a high value way, like providing a virtual guide or legal assistant – an crowdsourced expert who comes to your phone – and goes after areas where customers are paying for high value information? It doesn’t have to be completely FREE to qualify for an Attack. Just being so abundant that it is, as Anderson puts it, too “cheap to meter” is good enough. Look what happened to AOL’s hourly charge when the Internet become to too cheap to meter. Could that happen with the hourly billing system at a PR Agency, law firm or even Con Edison, when renewable energy really kicks in? Abundance has its problems too. Facebook may be FREE but who pays us for stealing my children’s attention for hours a day as they jockey for social standing? FREE email means spam. When 18h Century settlers around the Appalachians learned to grow corn in abundance they soon found the best way to store it was to make whiskey. That lead to oddities like farmers drinking whiskey for breakfast. When the government tried to levy a tax it sparked a rebellion. The solution, as it runs out was Canal and then Railroad transportation which brought the corn to market while it was still fresh. So yes, where there is FREE there is a solution of one kind or another. It just may not be obvious and it may not come quickly - but its there. Soon, the tobacco industry and all the governments that depend on their steep taxes will be embroiled in a similar Attack as e-Cigarettes bring on “almost FREE” both in terms of health and cost to this age-old practice. Barry Diller is latest Media Baron to take on FREE and believes he can get people to pay for content that others expect to get FREE. Maybe he knows something. But as the smartest players have found out, FREE and Paid can coexist in many ways – often reinforcing each other with FREE offering exposure and paid offering quality assurance, times saving, exclusivity and status. Our next iBreakfast on October 7 will take this whole issue apart at our first (almost) FREE event. It's FREE to members and their guests……..and as our New FREE definition explains, that qualifies as FREE. By revisiting Twitter we learned that smart marketers have used the microblog platform to develop a following and then build a platform on top of that. Giving people timely, essential information was the key to growing a loyal audience for StockTwits which enables investors to follow the picks of savvy traders. Now, according to Phil Perlman, their website has become a hub for independent investors, traders and other high-value Wall Street players. Stephen Gilberg used Twitter to build a following for his WineTwits start-up, where wine-lovers could crow about their favorite wines in real time. That has grown into “Social Grapevine”, a wine drinkers’ social portal with useful filters and Twitter management tools that any social marketer might covet. Ariel Hyatt talked about the ways musicians, mostly independent, but also established artists, have learned to use Social Media to build a following. With Twitter, they have learned, the more personal, the better. After all, they not dealing with customers but fans. While some musicians “just want to play their instrument” many others have figured out the lessons of Godin’s “Tribes” and Anderson’s “1,000 True Fans.” With a following, and no record company to pay back, many musicians have learned how to flourish. 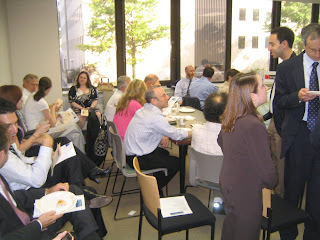 Entrepreneurs looking for new funding got an eye-opener to the future at the July iBreakfast. Top of the list - according to Steve Arnold, is that open-source is becoming a mandate for all government-related RFPs. If you are going after of City, State or Federal money - these are the magic words. For Entrepreneurs looking beyond the tight VC market - where many, many deals are chasing very selective investors offering low valuations - PCMexchange holds hope for the future. Here Entrepreneurs can raise money directly from pools of investors online. While this technique has been tried (Wit Capital to Prosper) sooner or later the SEC has moved in to shut them down. But now we are seeing a new way of dealing with this. PCM Exchange uses a new combination of techniques - it is founded by a broker-dealer and only accredited investors get access to the site. But it is it open to all entrepreneurs. The advantages for investors are that they can vet the entrepreneurs as a group - saving them from multiple due diligences. For the investors, the site will offer a kind of stock exchange thereby offering liquidity for their holdings. IndieGoGo offers a crowfunding source for film and digital content. The trick here is that the pubic does not buy equity on the film only the equivalent of sponsorship or bragging rights. As the first in a new series of events that cover the funding of content - this iEvening got off to a rousing start. 3 investors spoke to a packed house about the opportunities and difficulties of raising money for a film project. The key today is audience and distribution - and most of it is digital. The old days of having a screenplay and a prayer and more or less over. There are exceptions but most indie filmmakers have to contend with using the Internet to build a pre-audience, and distribution and marketing methodology. Symbiotic Pictures, a new veteran-driven enterprise is actively looking for close-to-completion projects that they can place and leverage into a compelling deal. Marty Feinberg, talked about his movie investments with Penny Marshall and Martin Scorsese and the film projects he is looking at today. Slava Rubin showed how his site, IndieGoGo can help moviemakers raise money from fans and build an audience at the same time - a critical ingredient in getting studio attention. And money. A variety of projects were pitched making a powerful impression on the investors. The star of the evening was Frederic King of Fountainhead Films, two of whose projects - Manuela, about Simon Bolivar's mistress (hints of Evita) and B.I.K.E a film about counterculture cyclists - got the judges' attention. We will soon be posting these pitches online through an arrangement with IndieGoGo. After a few slow months when start-ups seemed to have left the marketplace - the tide turned. Really turned. But now, entrepreneurs are staring at another kind of challenged marketplace. The investors are back with money – since most stayed out of the stock market – but it is a buyers market, so valuations are down and investors can really afford to pick and choose. Entrepreneurs today really have to be able to survive on their own for as long as possible. But then again, strange things happen once you they in play: one entrepreneur who pitched his plan and won an iEvening in 2008 wound up being hired by an investor on the panel to run a different, but related company. So his start-up turned out to be his job application! We wish him well! At this event we were oversubscribed but nevertheless managed to cram 8 new companies into the pitching arena. First was Clothingwarehouse.com, a moderately profitable company selling men’s closeouts at highly competitive prices. Using SEO they have developed a good Internet presence but they need to build the software to handle more precise customer needs. Sometimes its better to be pre-revenue and offer the moon than be moderately profitable and ask for help to make the next step forward. Myclasscancelled.com is a seemingly needed service that informs students if their class has been cancelled for the day. Apparently, this is a frequent occurrence and colleges have no obligation to inform the students. The investors however thought much bigger things than this and wondered if it could be used for all kinds of cancellations. As it happens, the next day I found that my dentist had unexpectedly cancelled my appointment and I never got the memo. So we get the pain! Escapeer is an aggregator of escapist and adventurist events. There are plenty of these outings and the people who seek them out – the under 40 set - are a prized demographic. As slick as the site looked and as compelling as the presentation is, it appeared that the judges needed to be told just how big this market really is. Parent Media is a company that first appeared to us as a profitable photo-contest site for proud parents. When we discussed the plan with the entrepreneurs before presenting - as we usually do - we found that the photo site was really the hook for a much larger enterprise: a loyalty site for parents with babies and of great interest to marketers like Proctor & Gamble and so on. So the pitch was duly restated and the proposition was compellingly delivered. ClipboardMD is a great idea in a market that is clearly about to explode – digitized medical records. This system enables people to keep their medical records in one place and have them verified as well when being admitted with ease by a doctor or hospital. However, the issue with an idea like this – even though it only needs to be used by a relatively small number of practitioners - is customer adoption. What the investors want to know is which doctors are using it and what will it take to get more to adopt it in a cost-effective way? Povertysdemise.org is an interesting non-profit that could, in a way, be a profit center. It also suggests how welfare and other government services will be cost-effectively delivered. With this site, you can pick a child, family, block or region that you want to help and how - then the site makes sure the insurance, grocer or whichever service you support is paid as the recipient needs it. The money goes out as it is used and never directly into the hands of the recipient. Unfortunately, it is tough getting angels to think of investing in non-profits or, as one angel said: “most of my investments are non-profit!” On the other hand, if the business partners paid for the service – it could be a profit center. Hollyhood is a kind of hybrid music and social media site that also has a special hankering for the Philadelphia sound. Even though the presenter is experienced in the field and comes with a gilt-edged legal background, it is tough to differentiate in this market place. ApparitionAds is a company that serial entrepreneur, Richie Hecker, has cleverly bootstrapped with some strong players from the online ad business. The idea is to sell ads that appear during that tiny moment between website loads. So the slower your site – the more you’ll be hammered. (All the more reason to get FIOS and drop your Wi-Fi router!) This could be the most successful little ad company since Gator, but it could also be just as hated! The judges probably felt it was somewhere in between. The judges picked Parent Media as the winner with ClothingWarehouse.com as the runner-up. Congratulations, and good luck at Private Equity Forum. We usually do a VC Outlook iBreakfast once or perhaps twice a year – and they are good. But somehow the June 24th event was special in an extraordinary way. Maybe it’s the strange times we are in. People really needed to understand where we are headed and so Investors, by telling us where they are placing their bets – are also giving us a view into the future. It is also a tricky time because, on the one hand, there appears to be a rising tide of private equity. On the other hand, we see a lot of entrepreneurs but for all their enthusiasm, also lack a vision about the future. Most of all, entrepreneurs may not be thinking of what the Venture marketplace wants – only what they want to do. We understand that deals have become cheaper and investors can cherry-pick them in a way they may not have been able to do in the past. But what are they looking for? Most of the exits are closed – the IPO market is all but dead, few investors speak of building a great profitable company in the old enterprise-building sense of the word. M&A is the main exit. Fortunately, many companies have strong balance sheets and after having laid off staff, they are finding that buying start-ups is the cheapest form of R&D. Great. Perhaps even better, foreign companies too, are eyeing the US market and they will often pay a premium if they feel they can get market entry. So what are investors looking for? According to Jeanne Sullivan, the companies they look for include tech-enabled service businesses, platforms and any high perceived value service that once required custom tailoring, that can be delivered in a mass format is in demand. Charlie Federman of Crossbar, a noted early stage investor looks for the first new idea in a marketplace. First to market is big deal and if properly executed, usually carries over in the long term. He especially likes ones that "export deflation" - i.e. offer a really low-cost alternative to a current business under price pressure. More importly, he looks for entrepreneurs who can adapt, since most start-ups find their real opportunity later. The business they end up is never quite what they started with. Somewhere, they’re going to have to take a left turn. Will they be ready to respond to that…..? Owen Davis has analyzed various investment deals and has laid out a kind of roadmap that would be an invaluable guide for an entrepreneur to determine which sector has the highest probability of raising capital in the New York area. Hint: social media and communities highest pitch topic – least invested in. Morgan Rodd noted that Milestone Ventures was increasingly interested in tech-enabled medical services. Based on the surge of investor/entrepreneurial interest we will be producing a new series of Start-Up bootcamps, business and deal structure sessions and more investor meetings. Last week I joined 3 other publishers to talk about the next phase in publishing at a consumer electronics road show in New York. We did something unusual – we talked about the way media content needs to change – and we showed eye-opening examples. Clearly, Consumer Electronics guys are mostly interested in TV and mobile apps. Reading is not their highest priority - but then you never where convergence is going take you. So here we talked about eBooks, mobile reading devices, the digitization of books generally but, more importantly what the title of this panel was all about: the change in media – its Act II. How content is about to become something different because the Media has changed - and so have we. This phrase, Media's Act II, came from Google’s CEO Eric Schmidt at the American Newspapers Association convention earlier this year. He informed the execs, nervously watching their papers edge out of existence, that they had done a great first Act in the 90’s by going online but now they needed an Act II. So what was Act I? I argue that it was what we used to call, in an earlier era, “shovelware” – they shoveled the contents of a newspaper online and threw in a few bells and whistles – a little search, a little feedback, a slide or two and a place to click. But for the most part, you read just like you did in print but with the inconvenience of a monitor. Shouldn’t the computer enhance the reading experience – either make it faster, better or something else? And now, with mobile (why we were at the Consumer Electronics space), something more suited for on-the-go reading? We showed 4 new publishig models, each unique but each complimentary in a way that probably defined the 4 corners of this coming universe: We showed books that are way shorter (ViziPress), way richer (Vook.com), way more social media involved (HarperStudio) and way more adaptable to higher educational needs (Flatworld Knowledge). Vook.com is about taking you into the world of a book – using video, interviews, multimedia and so on. If you love Sherlock Holmes, you’re in heaven. They hope that every great author will bring you into this afterworld of their creative space. If you’re the kind of person who watches the extras on your movie DVDs then you’re going to want this for your favorite books. They even hope you will pay a little extra for the privilege and publishers are interested in - not just the book - but the book world. ViziPress, my creation, is about visual condensations – a kind of visual "Cliff Notes" – of popular business books. If you are lacking in time we can tell you what a book is about in around 3 minutes - and do it in a profound a memorable way. We add music because it makes the process a lot more digestible (according to mysterious research) and we think their world will demand this for every book in existence. Interestingly, it doesn’t kill books - it excites interest in books that people may have otherwise ignored. It also helps that we can cite Albert Einstein as using visualization in all his theorizing (remember the one about riding next to a light beam?) and that we have the best-selling "What Would Google Do?" as an example of a visual summary. HarperStudios is a new kind of publishing arm of HarperCollins – like Saturn was for GM but, we hope, with all the upside. Their idea is to create a new kind of relationship with authors and booksellers alike – something like the 360-degree relationship record labels are establishing now with their artists. They look for authors to share the burden on marketing - especially through social media and they actively seek out authors who have already developed major online followings (e.g. Gary Vaynerchck from the Wine Library). Instead of high advances and low royalties, they offer low advances and high royalties hoping the author is more motivated to make waves. And they don’t take returns, so they force the booksellers to be more judicious in how they order and place the books. All told, they represent the newer, leaner and more entrepreneurial style of publishing. Flatworld Knowledge is a start-up comprised of savvy college textbook people who have similarly reinvented their space but with even more twists – they have added a kind of modified Wiki. They hire the top educators to create college textbooks, enable the professors to customize the books for their own courses and then they give it away online. What students pay for is the on demand version of the book - printed for them at the college bookstore - but at much, much lower prices than typical textbooks. They also sell multimedia course material. As their investor explained to me, they plan to take a declining $10bn industry and turn it into a high growth $1bn industry – with Flatworld leading the growth. One thing is clear, the book as we know it – this final and only product of the writer’s creative process is about to become something quite different – an ongoing conversation delivered over many media and probably on the go…..
UPDATE Google is about to launch its version of news condensation with Flipper. Look out for this market to take off! As cell phone users increasingly turn to smart phones – how important is it to offer a mobile App? It is cheap ($99 registration fee with Apple), relatively easy to develop and distribution is assured. However, with 35,000 apps out there, it is tough to stand out from the crowd. If you are lucky, like iBird (see NY Sunday Times) and Apple thinks you can really showcase the iPhone - they will give you millions of dollars of free advertising. A little less lucky - and you become the featured selection and so on. But this is a kind of lottery, most developers have to think about the long hard slog and such time-tested techniques as piggy-backing on other platforms. According to Eric Litman, whose company, Medialets helps companies track and optimize the use of apps, having a mobile app may be a necessity of doing business. Instead of selling them though, many will become ad-supported. Think mobile widgets…..
More significantly, as mobile increasingly becomes a business platform as well as a lifestyle utility, the applications will become useful extensions to existing businesses – whether it is mobile sales people on a contact- and order-management system, or field engineers using specialized software to solve technical problems. These will be more than cool apps - they will be the future of the workforce. Any business that can put you in the field, will. And they can manage their workforce through control software - and stop paying rent on your cubicle. While Apple is leading the mobile App charge because of the iPhone’s extraordinary range, power and graphics, the other platforms are already in the game and are likely to follow their example. In the case of Alex Muller’s Slifter, local shopping has been an important driver. Since his company began developing in 2007, having reached out to many platforms and worked with many telcos - they are mindful of the developments from Google’s Android, Nokia, Palm Blackberry and that dark horse in the race, Microsoft. Apple is hot but still has only 26% of the Smartphone marketplace. No one expects Microsoft to lay low for long. When they wake up to this marketplace - it could spell opportunity for developers since Microsoft has a way of spending itself to the top. Mobile use is not only likely to grow, but it is poised to become a ubiquitous platform: it is a computer that happens to be a phone. In many parts of Europe, where the telco’s charges are less onerous, it is a kind of charge card. In the 3rd world, especially Africa, phone usage has grown in 15 years from a few million landlines to over 50 million cell phone users with generally high quality service. As smart phones enter the picture they have the potential to become the standard trading platform that could transcend national borders and economic systems. Ditto for many parts of Latin America and Asia. The new versions of SmartPhones (iPhone 3.0) will greatly enhance the eCommerce possibilities of this platform. The specifics of Ken Engels' Curious Brain, a guitar teaching tool that uses the sound and graphics of the iPhone in an extraordinary way – think iChord instead of iBird - make it clear that the iPhone's potential to train, inform and empower will be tapped worldwide. That may just be the beginning - Version 3 of the iPhone adds the ability to sell within applications. This way users of an app – say a training store - can buy more lessons or other content while they are on the training site. This opens to the door to new kinds of upsells and giveaways. The current model is typically, the Fremium – give away a trial, low-cost or free app and then upgrade the user. Now it’s about selling add-ons or more content – giving away the razor and selling the blades. So have have you taken your place in the mobile App space yet? It’s about time that we got real with the Social Media world. If you have an audience and you want to pay off your rent/mortgage/student loan/Tesla Roadster, you’re going to have to confront the issue of getting paid for your blogs. Companies will offer them to you – generally in the form of goods – but sometimes cash. So why shouldn’t you take it. I don’t have a problem with it although most Social Media orgs do. My only issue is transparency – if you’re getting paid, let me know. Not only that, but what is the level of sponsorship? Are they giving you stuff or money and is it your unfettered, if perhaps biased impression? Or do they have the final word or feeding you the talking points? There’s quite a difference and an industry symbol cold clear that up in a heartbeat. Like advertising, once the public realized that ads underwrote their newspapers and TV, they accepted it – it was a social contract. We clearly need the same thing here – and business will take off. Social Media Report Anticipated FTC Action on "Blogola"
According to the FTC in a story reported in BusinessWeek, bloggers who get paid for mentioning products – sometimes known as Blogola – will become subject to their scrutiny. For those of you who took the time to attend or read the iBreakfast’s Social Media Council Report, you’ll know that not only did we discuss this issue, but we described its resolution as an essential part of the Social Media Economy – providing of course, that it was transparent. More than that, there are various degrees of blogola – from free product usage to our right payment and control over the actual content - and we should be able to rate that so the reader knows. The main point is that if we establish an open, transparent system, we help everyone. But someone has to establish the ground rules and they have to be implemented. Share your thoughts with us – maybe we’ll be the ones to take on this quixotic effort! Jayson Dinsmore, NBC Universal · Cristian Cussen, MySpace Video · Allison Dollar , ITA · Kevin Chou, Watercooler, Inc.
Social Media Invades Hollywood. This event was sold out thanks to great speakers from MySpace (Christian Cussen), NBC Universal (Jason Dinsmore), ning and Watercooler (Kevin Chou) plus a cameo appearance by a child star Aria Wallace from Niceklodeon. Social media is having a great impact in managing the fan base for shows and in developing the career of individual talents. Most significantly, both MySpace and NBC a re suing social media to develop shows both in generating ideas, tsting them and then building buzz. MySpace has developed custom concerts and NBC has synergized well with reality TV shows. How do you access capital in these very trying times? VCs and Angels still have money but unless you are a successful serial entrepreneur or are prepared for ridiculously low valuations and high equity giveaways you may want to hold on to your business plan. Likewise, banks are tighter than Fort Knox, so unless you don't need their money and your credit is too good to be true, you might not want to bother. That seems leaves a few choices other than rich Uncle Joe, assuming he kept his money out of the market. So, in this half-day conference we looked at some of the near and long-term solutions to this problem. If you are a company with receivables - purchase orders from creditworthy companies - then factoring is the shortest way to raise money. However, the rates are legally usurious - up to 38% APR. But with the internet, a company like The Receivables Exchange has opened your receivables up for auctioning and could theoretically lower that rate by half or more. For those who need smaller loans - under $25,000 - then you could have used crowdfunding with sites like Loanio, Prosper etc. At least you could have until November of last year. That's when the SEC, probably reeling from its criticisms over poor market regulation and overlooking the Madoff's $50bn scam, stumbled upon the one true threat to the banking system - the online aggregators of people to people loans backed by little more than good credit scores. This $100 million industry worth say, one grommet on the "Tarp" was determined to be in the business of selling securities, so they shut them down pending new filings. The solution appears to be some legalistic maneuver of repackaging the loans as bonds and so on. Nevertheless this type of funding will in likelihood return and probably become increasingly available to small business. One side benefit is that Loanio found that it could go public by self-registering, which is way to dramatically lower their underwriting cost. This leads us to the closing presentation by reverse merger guru David Feldman and iBusinessPartner Larry Langs who specializing in taking companies public through so-called sell deals - i.e. using a defunct public company shells to go public instantly (the stock exchange used this technique itself when it went public!). This is a great idea if you can attract investor money - especially when the market recovers. The only downside is the high cost of quarterly filings. Then again with the internet, those costs could come down. This breakfast came at a critical juncture in the Newspaper industry - Seattle, Chicago and now, Boston face the possibility of losing newspapers. So what has happened and where are we going? It was no small irony that the headlines of the day trumpeted the "Craigslist Killer" - the med student who found his victims on the classifieds site - because in many ways, Craigslist, by undercutting the formerly profitable newspaper classifieds sections (by some $64 million in one year in San Francisco) became the Jack the Ripper of the newspaper world. The other big player in the newspaaer world is Google - but whether they are the Jekyll or the Hyde is no small debate. According to Google's Eric Schmidt, Newspapers did a great Act 1 in the 90's by going online - but haven't come up with an Act 2. I couldn't agree more - what they did was to put print up on a screen and add search with a little feedback mechanism. But that is really what we used to call "shovelware." They took the content from an old media - print - and shoveled it onto a new medium - online. Over time what I believe happened is that online papers taught people they don't really need to pay for the print product, and then they learned that reading a paper online wasn't such fun either. But then, returning to print was now unwieldy and a huge time sucker. Ergo - newspapers actually trained their readers into becoming dissatisfied customers seeking their news elsewhere. From a strictly viewing point of view - they need to find a way to tell stories that are more readable online - especially as we go to mobile. We also need information compression and that calls for way of telling stories conceptually. The presentations began with Journalism.com's Gordon Crovitz, a new venture backed by the legendary Steven Brill that hopes to gang the newspapers together and, in some ways, take on Google to overcome the "original sin" of giving away their stuff for free. Through subscriptions and the artful of use of "fremiums" (giving some stuff away and then charging for the more desirable parts) they believe the public can be encouraged to fork over again. It happed with iTunes vs. the pirate music sites and certainly, as former publisher of the Wall Street Journal, Crovitz has shown it can be done with a business newspaper. But according to veteran Google analyst, Stephen Arnold, while that might work - assuming as in my analysis, the victim has already been dispatched (sorry about the metaphor, but that was the news of the day! ), the better answer may just be in finding more ways to work with Google. In Arnold's view, Google is a technologist with the world's biggest audience, finding ways of working with them and their various payment mechanisms (Adsense being the simplest) will probably enable you to do very well indeed. Fight them and they will incrementally swallow you because the news flows to them anyway. In his view, their ability to bring all data types - the video and pictures as well text along with fantastically big audience are unstoppable and their way to aggregate advertisers and buyers is not to be ignored either. Message to publishers, if Google doesn't call you, call them. You'll be glad you did! Myles Fuchs at PressSmart offered another view which is that by using multiple digital delivery systems, his company can monetize whatever content newspapers already have. This is particularly the case in the one healthy area of the newspaper economy: hyperlocal news. Jeff Bogart agreed, noting that his local town blog outdistanced the big area newspaper in terms of true local coverage - events, town hall meetings etc. Interestingly, locals may have survived since most local newspapers stayed behind the technology curve, so their resistance made them a subscription necessity when everything went online for free. But again, according to Bogart, his success with aggregating local bloggers could also undermine that sanctuary - it only takes one local news blog aggregator and the local papers will be staring down the same storm the big city papers are facing. Finally, Mo Krochmal a former journalist turned J-School professor at Adelphi talked about what he teaches his students. If, like me, you are about to fork over $160,000 for a fancy degree for one of your kids you might want to reflect a moment. According to Krochmal, as long as the students are comfortable with the fact that no fancy job awaits with a corner cubicle and networked computer, that they understand the reporting fundamentals and can blog well then, with a little entrepreneurship they should be happy. They might not make rent but they'll be happy. See other reports on Steve Arnold's blog. Social Media has become all the buzz for its ability to build an audience and create buzz. But how do you get the viral action going? This was the topic of the Search and Social Media iBreakfast. By now, most Business users understand that Social Media is a way to build a network that was either difficult or verboten under the traditional Catch-22 Permission Market rules of email list building. You can't spam but if you ask people for their permission to market to them, they are likely to say no. Kevin Lee showed how Didit.com's relationship with Dun & Bradstreet enables companies to be found on the search engines in conjunction with D&B. This is a classic piece of brand leapfrogging but it works and the cost is relatively low: you list you company's Power Profile on their site and you look all the more credible for it. Chris Winfield shared some of his secrets for building lists for publications - get them listed on recommendation engines. Digg, deli.cio.us, Stumebleupon are all sites that people have become used to sharing their online finds. By directing your website and press releases to these sites as newsworthy. It just so happens that one of the companies that presented at the iEvenign for Start-ups, GenGreenLife.com found itself in the public eye with upcoming coverage in Forbes and Entrepreneur magazine, precisely because they got noticed on StumbleUpon.com. Lee Odden, CEO of TopRank and leading Midwestern SEO company talked about using all these techniques for building your own professional and corporate visibility. The key is using metrics from sites like buzzlogic and quarkbase to keep you on track of the viewers. The bottom line with getting picked up on Social Media and recommendation sites is that if you're not popular be useful, that will get you picked up. Be sure to read the Social Media Council Report on the iBreakfast Blog .